Explanation: In the last week, Comet Ikeya-Zhang has become bright enough to be just visible to the unaided eye. Based on its present activity, observers are optimistic that Ikeya-Zhang will become substantially brighter. This composite color image from March 3rd, captured with a wide-field telescope, shows this active comet's bright, condensed coma and a delightful array of subtle structures in its developing tail. The bluish tail stretches for 5 degrees or so against a background of stars in the constellation Pisces. In the coming days look for the comet hanging low in the western evening sky (below a bright yellowish Mars), eventually becoming difficult to see in the March twilight. But after April begins, Ikeya-Zhang will become a predawn object climbing higher into the morning sky as the month progresses. Cataloged as comet C/2002 C1, improved orbit determinations now make it seem very likely that Comet Ikeya-Zhang has been around here before. 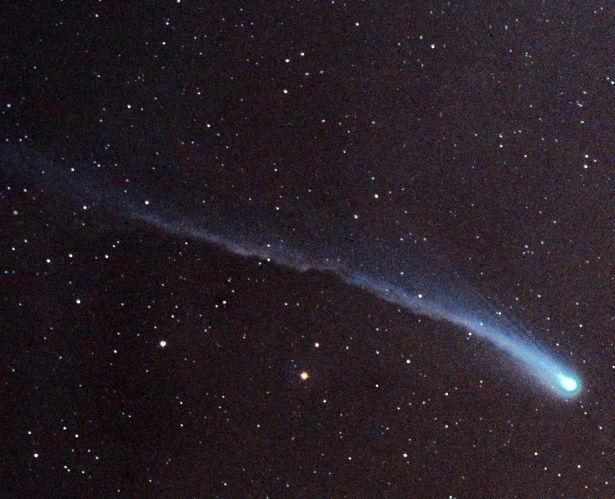 Refined calculations indicate this comet's last trip through the inner Solar System was 341 years ago, in 1661, when it was recorded as a bright comet.